A great gift for corporate meetings, hotel gifts or event giveaways. 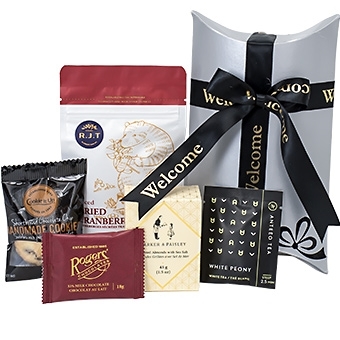 Each Welcome gift box is filled with an assortment of gourmet treats such as: BC grown dried cranberries, chocolate chip cookie, Anteeo tea, roasted salted almonds and a milk chocolate by Rogers' Chocolate. Box size 7x5.5x2"
The contents of this gift box are carefully arranged in a pillow box. 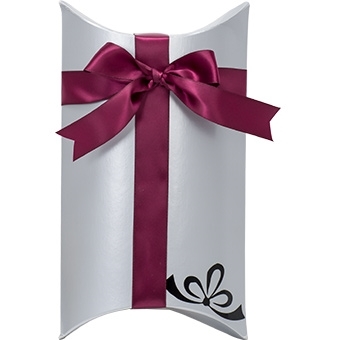 We decorate it with a beautifully hand tied ribbon and includes a gift card with your personal message. If you select personalized ribbon, the imprinted ribbon with the text or company logo will be tied around the box instead of the regular ribbon we use. * Image shown with optional imprinted ribbon and decal. Please note that this gift may require 1-2 days for assembly.